The large and impressive looking 10 X 8 Lavenham Summerhouse has a classic, East Anglian design and will serve as a lovely place to take in the evening, have a drink or just relax in general. 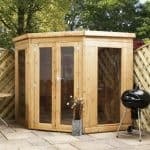 Made with top of the line materials throughout such as toughed glass, Scandinavian Redwood and corrugated roof sheeting. 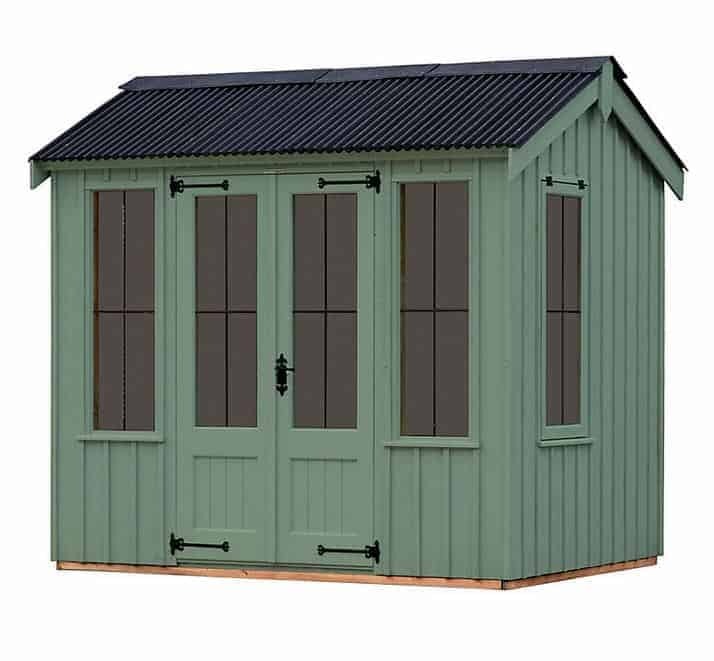 The Lavenham Summerhouse is high class all the way and would certainly make a big impact in any style of garden. 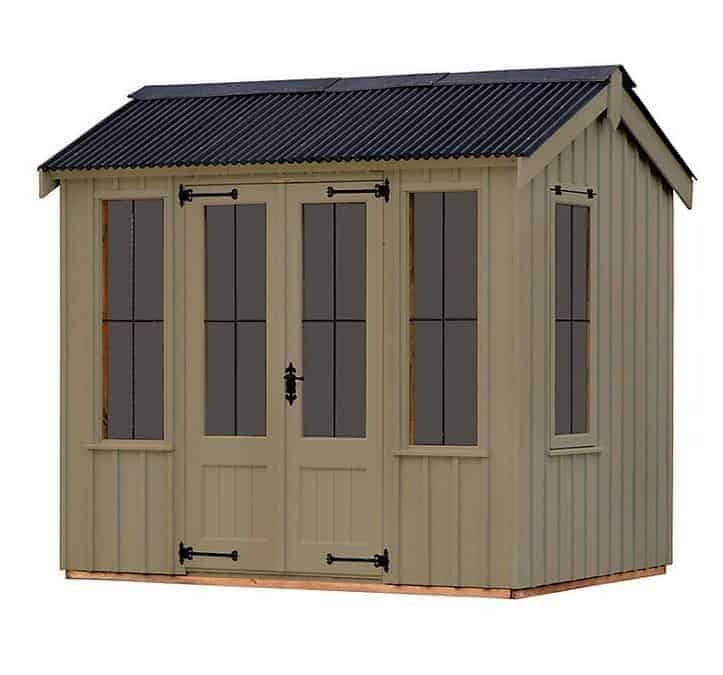 With its corrugated apex style roof, you will always be confident that no water is getting in through there. And that classic, sawn board cladding is going to just keep looking great as the rain bounces off it. Two large doors make it so getting in and out will not see you have to twist and turn to do so. Also the windows look great and they let you see the world outside….. as well as letting people peek in and see what a great summerhouse this is! IMPORTANT – Why we recommend buying this product from the National Trust over other sites. At WhatShed we strive to help give you the customer the best possible information to help you decide what garden building is right for you. The following are the reasons why we say – Buy from the National Trust for maximum consumer protection!! All online retailers are obliged under the distance selling regulations to offer a 14 working day right to withdraw from the contract to purchase. Starting the day after the date the item is delivered. If you buy your garden building in a store or showroom please be a ware that you are NOT coved by this and you are stuck in many ways with your buying decision if you decide to change your mind a few days later. Item damaged in transit = We commonly see the complaint with other retailers that the customers garden building gets damaged in transit. Most other company seem to do everything they can to get out of helping you if this happens. The real stand out service that the National Trust offers goes way beyond what we have seen from any other merchant. They say “If the item was damaged in transit. If you take delivery of a National Trust Online Shop package and the contents have been damaged in transit, you can return the item(s) to us within 30 days of receipt for exchange.” That is an outstanding commitment to customer service and we wish more retailers in this sector could boast the same levels of commitment. In short unlike some other merchants we have reviews we feed 100% confident with the way the National Trust is handling its customers in the event they run into a problem. Time and again we see reports of products getting damaged in transit. We strongly feel that the National Trusts no quibble 30-day returns guarantee means that if for any reason you have with your purchase you are in safe hands. We only wish some of the other retailers would offer the same outstanding level of protection and peace of mind that the National Trust are giving customers. To see the full National Trust returns policy follow this link, we are sure that you will agree they are the #1 choice when it comes to buying your Crain garden building from. Buy from the National Trust for maximum consumer protection!! Here we have the largest Lavenham Summerhouse that Crane have! With a very impressive 9 feet 8 inches in length and then a very nice, 7 feet 9 inches of width. 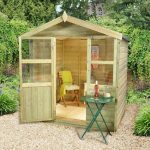 We feel that this is a summerhouse where your imagination can run riot when it comes to laying it out just the way you want. Made from strong as a bull, Scandinavian Redwood, you really do have a summerhouse here that is going to be up to the task of lasting you for many good years. To save you the hassle of dealing with the local council and getting planning permission, Crane have set the ridge height of the roof at right around the seven foot mark while at the eaves you have roughly six feet. This is more than enough headroom for most folks and because of how strong the wood is, you can easily throw up some shelving on the back wall to really maximize the space. The roof is probably the first thing most people notice when they see this summerhouse. 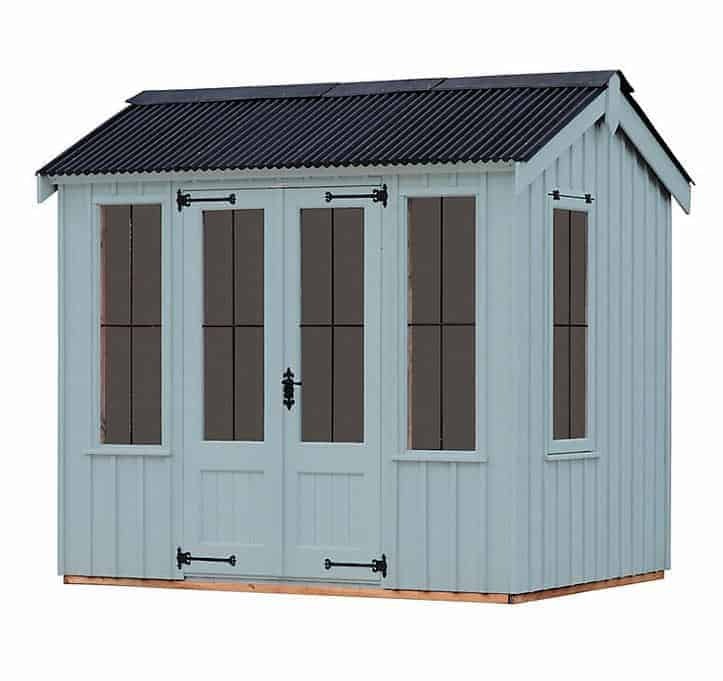 The apex, corrugated roof is a deliberate design choice by Crane to make the summerhouse have the look of a classic, British style building that was popular many moons ago in the East Anglia area. As well as being easy on the eyes this corrugated roof make sure that the rain just runs right off and does not sit and seep inside. To make sure the roof is nice and secure there are some 19 x 125 mm tongue and groove roof boards that are made with Scandinavian Redwood like the rest of the summerhouse. One thing that we are sure people will love is the pine effect ceiling that is covering up the roof boards. 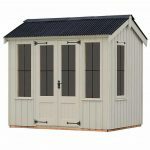 A summerhouse is only as good as the cladding it is made from and we are happy to say that the 12 x 125 mm sawn board cladding that is used here will see even the hardest rain just bounce off and stay outside! The cladding has a very “old school” look to it which along with the corrugated roof gives it the classic feel and style Crane intended. Crane, to give it a little bit more of the wow factor have put on a very stylish, 16 x 38 mm topping that is evenly spaced out and it looks fantastic in the process. The frame of The Lavenham Summerhouse is a frame that is really going to be still standing strong many years from now. At 19 x 50 mm thick and made with that amazing, Scandinavian Redwood, we are very impressed with the frame that Crane have constructed here. We really are very pleased that no corners have been cut when it comes to the framing which does help add to the longevity of the summerhouse. So even ten years down the line your summerhouse will be just as sturdy as it was the day Crane came to your house and built it! 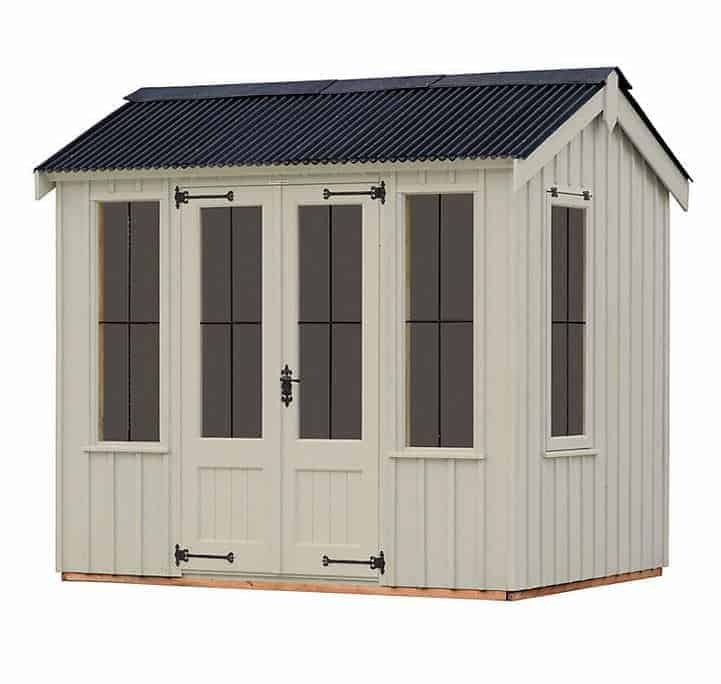 If you have kids or grandkids running around you will be pleased to know that this summerhouse can take a little bit of “rough and tumble” that kids like to do. To make sure that you can fit in a few chairs, perhaps a couple of tables and most likely some kind of fridge or cooler to keep your beverages in, Crane have used the exact same 19 x 125 mm tongue and groove boards that are keeping up the corrugated roof up. As these are made from that powerful, Scandinavian Redwood, you will be able to put pretty much anything you like in here! Underneath these floor boards we have 38 x 59 mm floor joists which keep the summerhouse level and add a little bit more strength to the flooring in general. 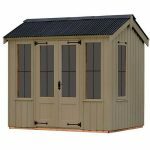 This summerhouse will be made with the best materials and with a lot of care by Crane, but to make sure that it is still looking good and serving as a nice place for you to spend some quality time it does require some effort from you. Nothing major, but we do recommend that you make sure you treat the wood when you get the summerhouse. The two year warranty offered by Crane will see them come to your property and make any repairs or replacements that are required. 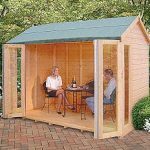 This warranty does only cover, general wear and tear so no accidental damage, but if you keep the barn dances down to a minimum we are sure you will be ok. Crane will also advise you if the spot you have picked to place the summerhouse in, is not suitable. If you decide against taking their advice then you will not be covered by their warranty. Getting in and out of the Lavenham Summerhouse will be no problem because of these lovely, 1830 mm wide and 1100 mm high double doors. These are awesome and offer more than enough space to get your items in and out without any kind of juggling or wrestling with them. The doors do each have a nice window on them and in addition to this Crane have used some very classy black cast iron hinges and have done the door handle and lock in the same style. We love how the door opens and closes just so smoothly which is mainly down to these high quality hinges. Including the two windows that are on the door, The Lavenham Summerhouse has six windows. The two which are on the door are just a tiny bit smaller than the rest. The front of the summerhouse has another two windows on them and then there is one on each side as well. These windows are just such a great feature because they are made from 4 mm thick, extra toughened glass and there is this very interesting cross design in each of the windows. The windows on the side both open so on those hot summer days, grab a drink, open both the doors and make sure the windows are open and you are living the dream! A mortice lock is on the doors to make sure that all the great items you have inside will be kept away from sticky fingers this is a nice and strong lock and to be honest we do not think any kind of upgrade or padlock is necessary here. When it comes to privacy with six windows it is going to be easy for people to look and see what you have or are doing inside, but if you do want to make it so things are a little bit more private, especially if you plan on sitting in here during the darker and colder months then a set of blinds or curtains can easily be installed and keep out prying eyes. Crane offer you the choice of six different colours of paint to make the summerhouse fit into your garden. The choice of colours that you have are interesting and you do have some that are more natural and wood looking such as Dome Ochre, but if you want something more playful either Painters Grey or Terrace Green would achieve this. The other three colours that you can pick from are, Disraeli Green, Earls Grey and Wades Lantern. To score the quality of The Lavenham Summerhouse any less would be a crime! This is just so well made and done so with the very highest quality of materials. Crane made a very wise decision in using Scandinavian Redwood, a corrugated roof and 4 mm extra tough glass windows. 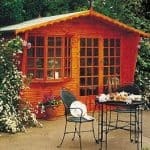 This ensures that you will have a long lasting summerhouse. While it may require a large garden to host this giant of a summerhouse we feel that the floor space you have here is incredible. You can design the inside how you want and not really have to make any kind of compromises or sacrifices like you would with less floor space. We love how Crane will not only deliver, but build the summerhouse for you! No broken thumbs, cut fingers or a poorly built structure at the end of the day. Yes this is expensive……. 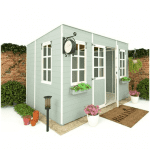 But this is the kind of summerhouse you would buy and it will last you as long as you need it to so in this regard along with the quality of materials, storage space and general craftsmanship that you are really are getting incredible value for money here. Final Thoughts: We know that the first thing many people will see here is that over five grand price tag, but we feel that for the money, you are getting a summerhouse that is really going to stand out, last for many years and in general be something that you and the rest of your family (and neighbours if they are lucky) will enjoy. If you want to make sure that you only ever have to buy one summerhouse then this one is it as with the right care will last you for a long, long time and because of the “retro British” design it will never go out of style.